In the middle of the night we got our first good rain. Lots of rain (well, probably a half inch). Thunder and lightning. Wet wet wet. Plants are happy, things are cleaner. And I kept thinking "I wish this was happening in LA and San Diego". Via die puny humans, a pretty horrid tale about an ex-CIA spook who was sent to jail for doing the CIA's work. When that work became embarassing to the CIA, they pretended they didn't ask him. Then the prosecutor in the case and the CIA conspired to cover it up. The agent has spent 20 years in jail, mostly in solitary confinement. If this were your employer, would you do your best work? Trumpeting the fact that more Americans have died since the president declared the end to hostilities as has before it is cute, but looking at the atrocities that come with this war is scarier, and more valuable. It is also scary to talk about many diferent aid agencies are pulling out of Iraq because it is so unsafe, but if we don't talk about it, Iraq will get as little support as we have given Afghanistan. 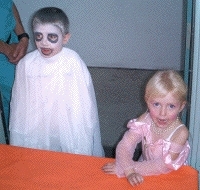 Pictures of cute little kids in costumes. This is from last night's festival at my niece's elementary school. That's not my niece, just friends of the family. Danah Boyd has a great short description of the social construction of technology. Anyone who wants to make interfaces more amenable to 51% of the world should read it. While the anti-foreigner sentiment in the country still seems mostly focused on Muslims, here in California, the INS still pokes hard at Mexicans. Here is a very intense version of the Richard Shindell song Fishing (4.5 meg MP3), from Joan Baez's "Gone From Danger" album. Note the lovely backup vocals by Dar Williams. CAUCE has an excellent analysis of the bill recently passed by the US Senate. There is good news and bad news there, but the real news is that we won't know anything until the Senate and Congress merge their two bills. The result could be... anything. Or nothing. Showing exactly how "money talks", here's a chart showing gross domestic product by language. If you get Harper's magazine, look at the ad on page 12 of the November 2003 issue. If you don't get Harper's, the ad can be found at the UPS web site. Nice sentiment, dumb photo: it is very badly doctored. His jacket is buttoned in the mirror, unbuttoned outside; his smile is different; the angle of the image in the mirror is completely wrong. Takeaway message from the ad: "we like promoting minorities, but we aren't all that hot on reality."